A definition will apppear here. 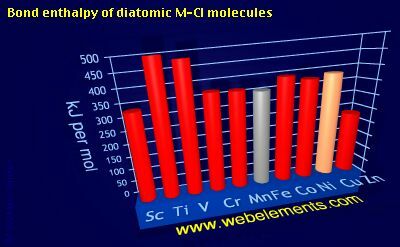 Image showing periodicity of bond enthalpy of diatomic M-Cl molecules for 4d chemical elements. I am grateful to Professor J.A. Kerr (University of Birmingham, UK) for the provision of the bond strengths of diatomic molecules data. The values given here are at 298 K. All values are quoted in kJ mol-1. Generally, these data were obtained by spectroscopic or mass spectrometric means. You should consult reference 1 for further details. A note of caution: the strength of, say, the C-H bond in the gaseous diatomic species CH (not an isolatable species) is not necessarily, the same as the strength of a C-H bond in, say, methane. Select from the following links to see visual periodicity representations for single element-halide single bond enthalpies in the highest halides or the single bond enthalpies for homodiatomic molecules M2. Bond enthalpies for homodiatomic molecules M2 (not necessarily single bonds. Each formula in the table below (M-O, M-F, and so on) is a link - select these to see visual periodicity representations for bond enthalpies involving your element of choice. Explore the element of your choice through this periodic table.